For these homeowners, wanting to reconfigure a fairly compact kitchen space, IKAN offered a solution and in-home design consultation that fit the look and budget. 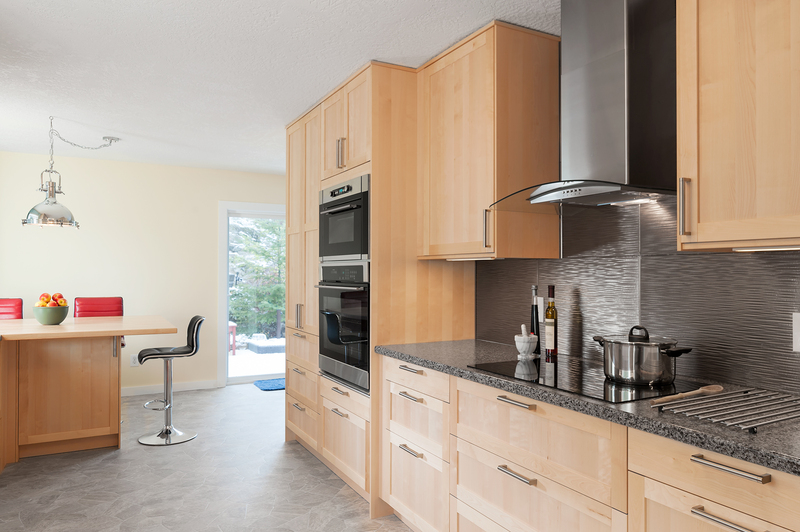 Working with IKAN designer Christine Pitts, the homeowners decided BJÖRKET birch cabinets offered the perfect light, warm look they were after. As stunning as they are on the outside, there is nothing like opening an IKEA cabinet and seeing the storage within. 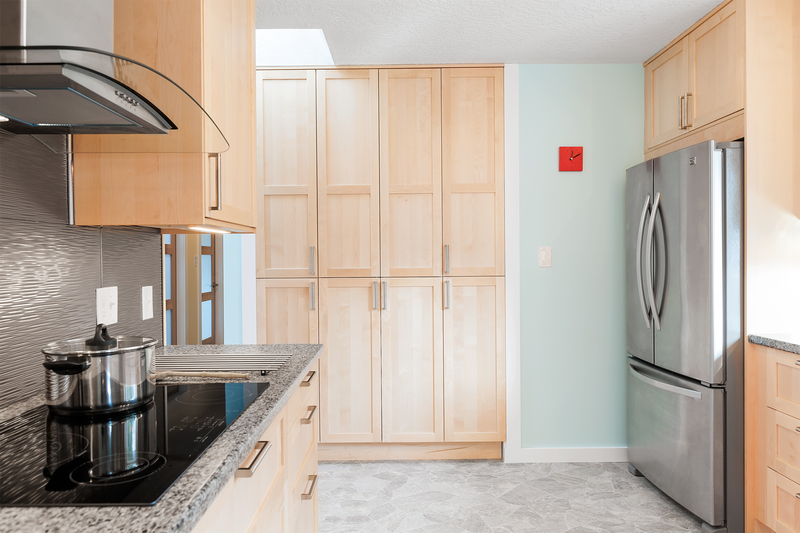 With 240 square feet, every space-saver was a bonus and the homeowners were able to open up the space to create a room where people can maneuver and visit with ease. Sleek ORRNÄS handles from IKEA tie into the greys in this fun colour palette and add a little sparkle. 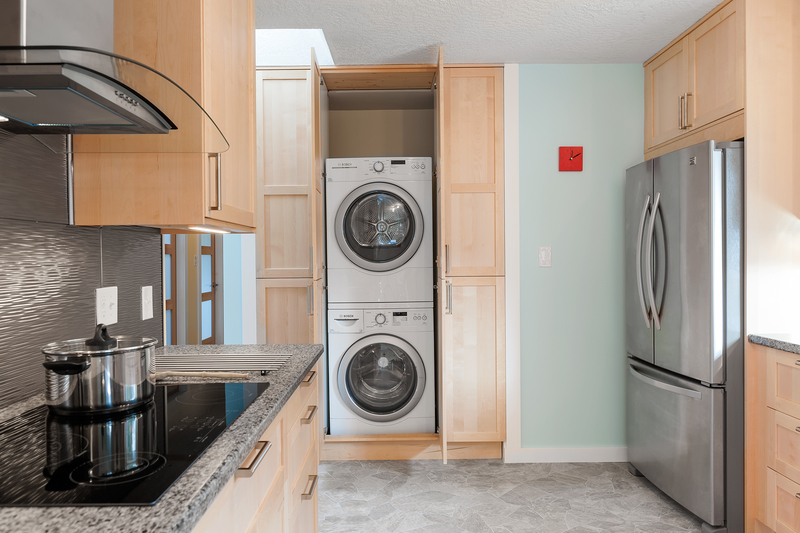 Our crew customized this cabinet for the washer and dryer, which many homeowners find convenient to have in or near their kitchen. 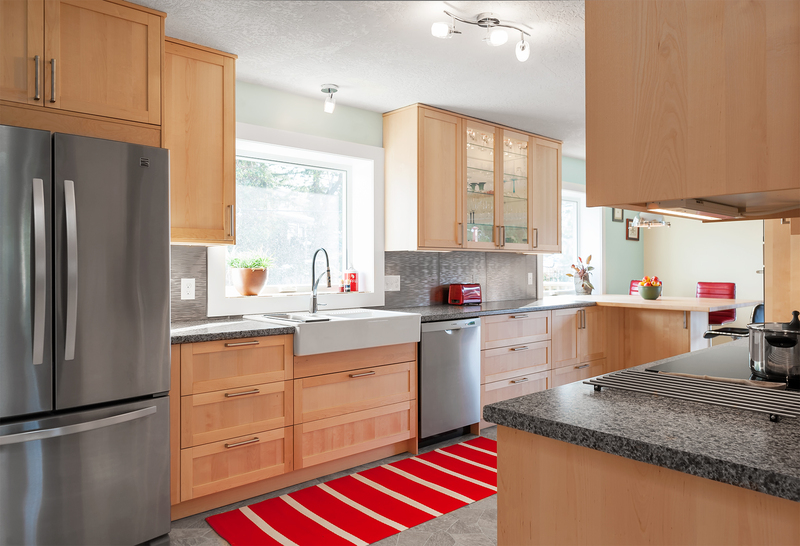 The Ikea DOMSJÖ double bowl apron front sink sits in front of a large window (doesn’t the wide window trim complement the sink and modern kitchen nicely?). 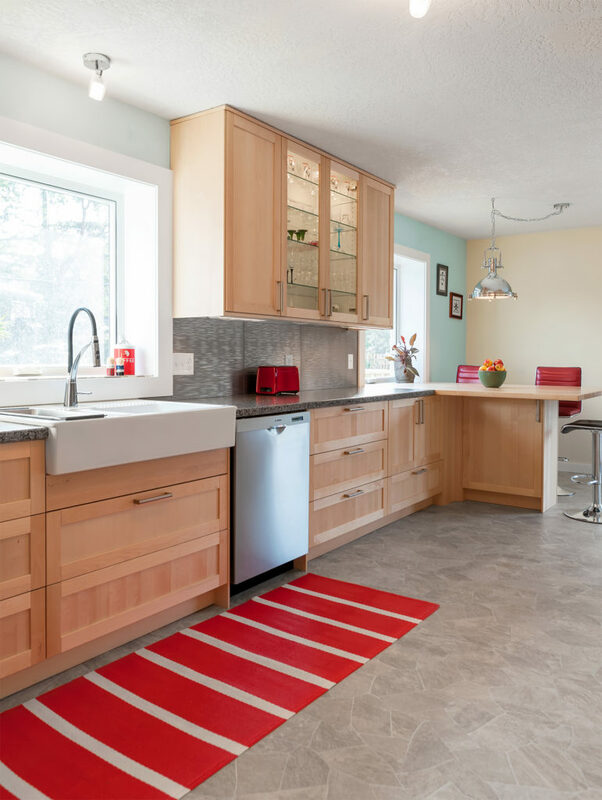 The sink is usually the most used part of a kitchen and it’s a space you want to make extra lovely, as these savvy homeowners did. 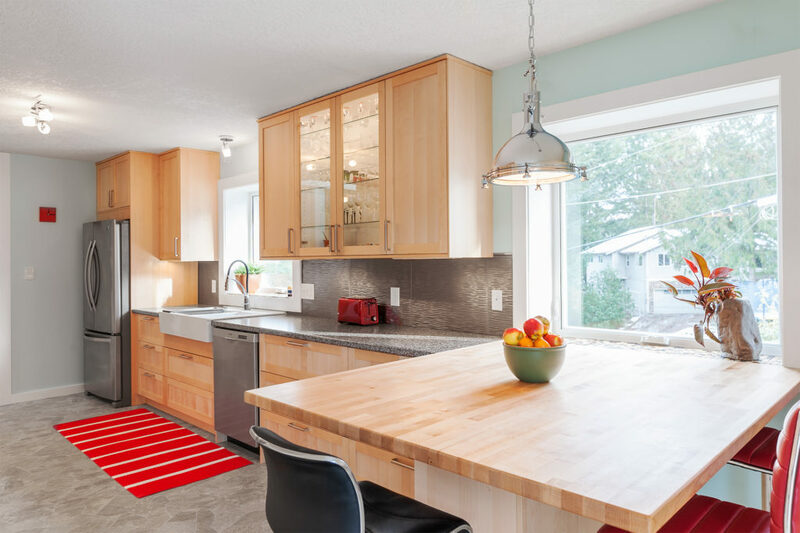 Homeowners often have trouble settling on a colour scheme for their space; as you can see, the red rug is one of many red accents that add texture and colour, and can be easily switched out if the homeowners fall in love with another accent colour. 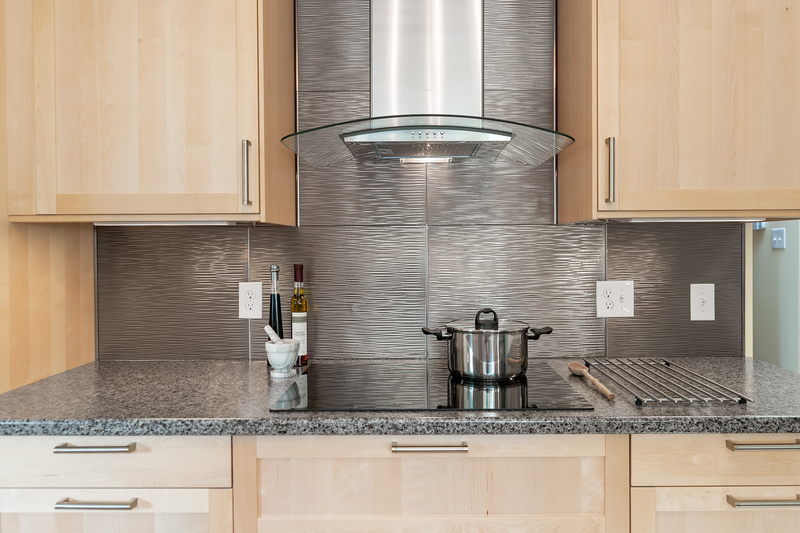 The neutral cabinets, counters and backsplash will make this easy as pie. 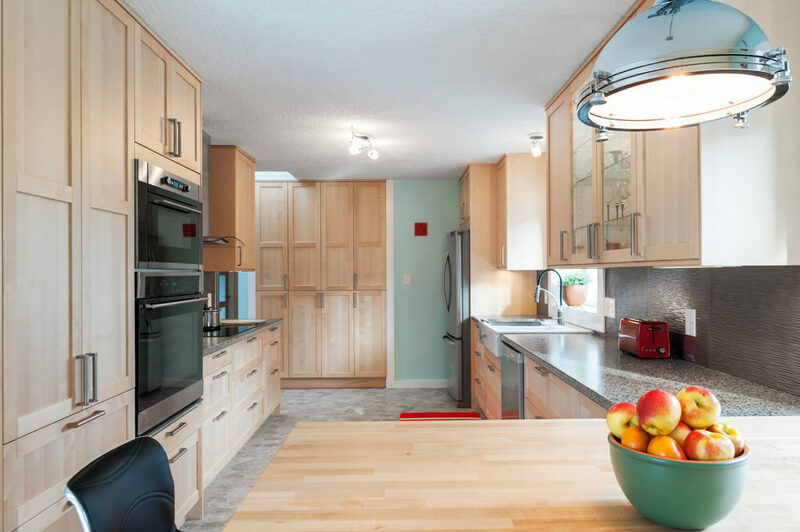 A peninsula at the end of the kitchen allows for a extra seating (you could even put another stool on the inside for a four-person setting). The wood butcher block makes that space feeling like a dining area.